Take any old bold color tshirt (soft and slightly stretchy are best), you can stock up on them at thrift stores like Goodwill and the Salvation Army for like $1. 1. 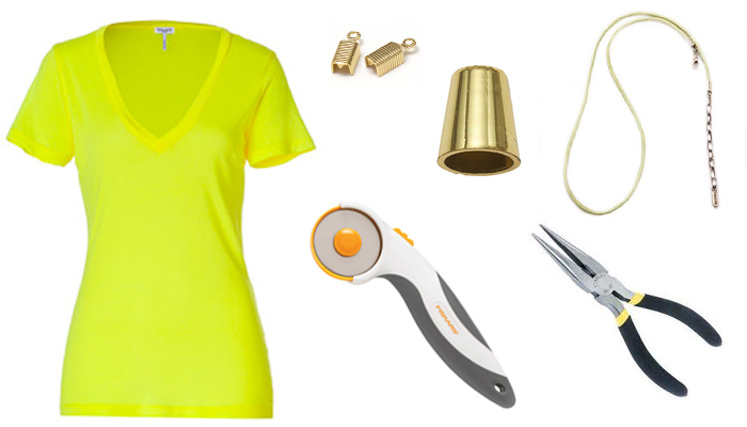 Cuttin’ Up – Cut the tshirt into 3/4 inch strips up to the underarms (you should get about 20 strips). Note: be sure to use a mat or cardboard to protect your surface from the blade of the rotary cutter. 2. Stretch it Out – Grab each strip at the seams on either side, and pull. Try to stretch each strip about the same width, so as not to have any really long ones that stick out from the bunch. Line the seams as you stack them up and it’ll make your job easier later. 3. Stack ’em Up – For added security, feed a needle through the stacked seams to give the necklace an overall polished look. 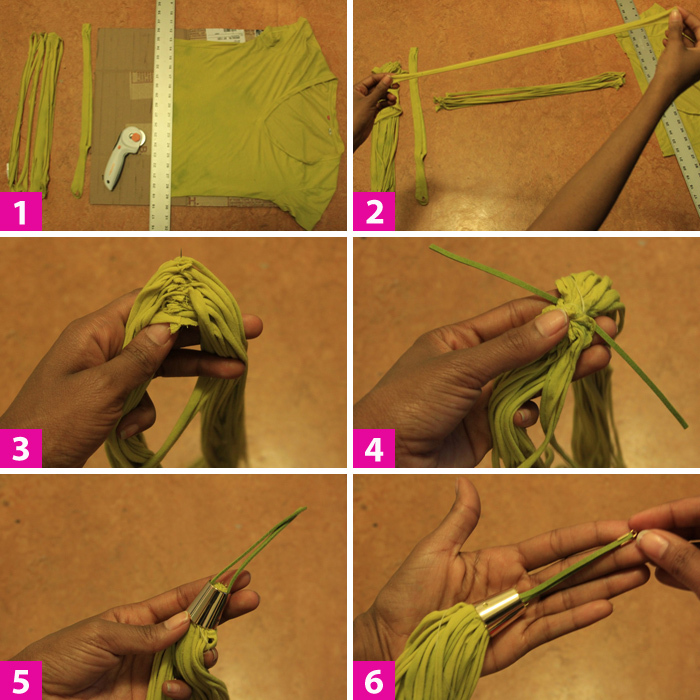 Wrap the string around the bundle several times, intermittently reinserting the needle through the stack. 4. Cut the Cord – Cut the synthetic leather cord to the desired length you want your necklace to hang, and fold it in half around the end of the necklace. 5. 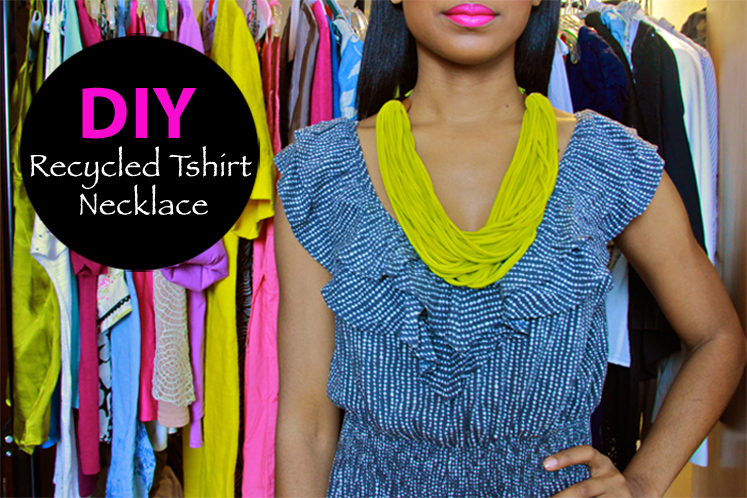 Positive Reinforcement – Pull the end of the necklace and synthetic cord through the larger cord fastener. Feel free to add glue or insert the screw for extra reinforcement. 6. Fasten and Clasp – Lastly add the smaller cord fasteners to each end, along with the chain and clasp. 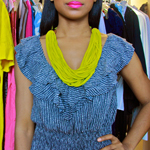 Now…rock your statement necklace with style!